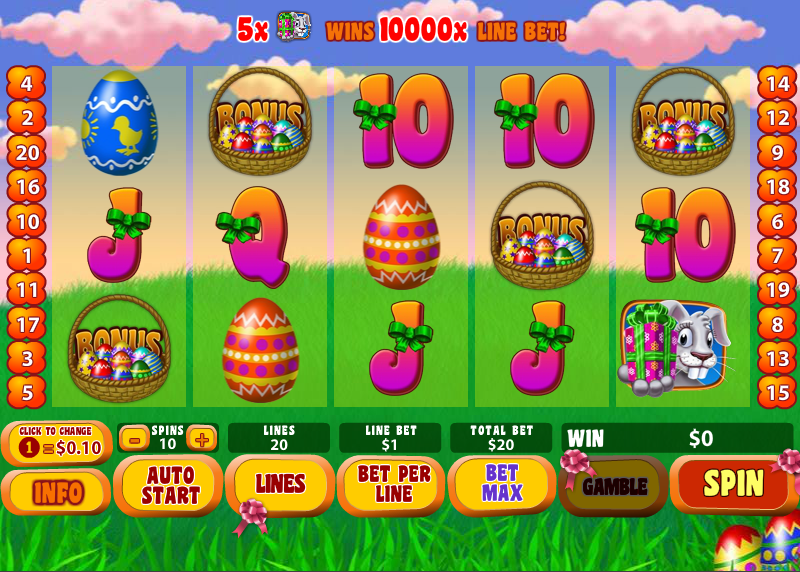 Bunny rabbits, easter eggs, wicker baskets – if it looks and sounds like an easter-themed slot machine then it probably is. Easter Surprise from Playtech is a bright and colourful tribute to that time of year when we spend a fortune on chocolate eggs and struggle to remember what we’re celebrating in the first place. 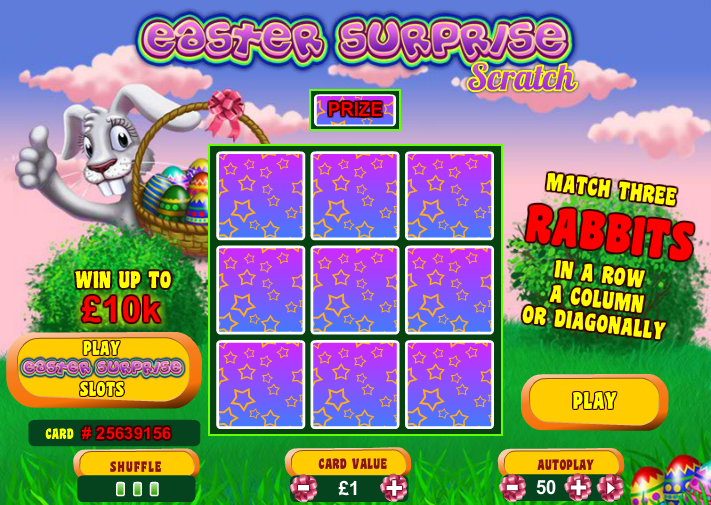 Easter Surprise is a five reel and twenty payline game set against the backdrop of a lush green meadow; it’s always a sunny day and there are one or two clouds in the sky. The basic symbols are Playtech’s standard playing card symbols but the higher value ones are all easter-themed. There are three decorated eggs coloured yellow, blue and orange, a rabbit holding a gift (the wild symbol), an Easter Surprise (the scatter symbol) and a basket of eggs (the bonus symbol). Landing three or more of the gift scatter symbols anywhere on the reels will earn you ten free games with all wins subject to a 3x multiplier. Spinning three more scatters while in this phase will win you more free spins. 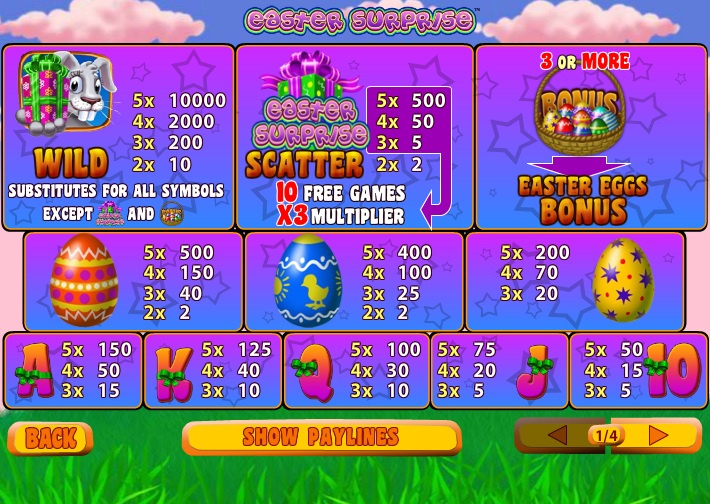 You need to land three, four or five of the Easter Basket symbols on an active payline to trigger this bonus game and you’ll be whisked to a separate screen containing a rabbit holding a basket containing six eggs; depending how may symbols you landed will dictate whether you get to pick three, four or five eggs with each one worth a cash prize. You can see this in action in the video below. Easter Surprise is the type of slot Playtech does really well; it looks good, plays well and includes a couple of bonus games for your extra enjoyment. You can bet from as little as €0.01 per payline up to €1000 spin.